Grace Episcopal Church is located in downtown Colorado Springs at 601/631 North Tejon Street. It encompasses the whole block on Tejon between Willamette and Monument. 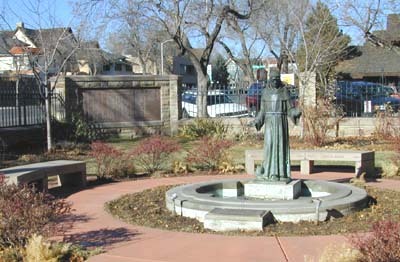 The actual columbarium wall is located in the northwest corner of the garden area at Tejon and Monument. According to GPS-derived geolocation (accurate to within 10 meters), the columbarium's coordinates are latitude 38°50'36.8"N and longitude 104°49'22.0"W.
Only the names of the deceased are listed here, but there are approximately 83 other names inscribed of people who are still living. The wall itself has room for only 15 additional names. Similar space for the engraving of names and marble will be provided, as necessary. In 1990 city ordinances were clarified that allowed Grace Episcopal Church to establish this columbarium. Members of the church and their families may be buried in this beautiful, well-tended garden. Ashes are placed in a biodegradable container supplied by Swan-Law Funeral Directors. Around the garden are several memorial benches and plaques, which repeat the names on the wall. The first burial was that of Harry W. Oborne, who was a key planner of the columbarium. An inscription at the bottom of the wall reads, "May the souls of all the departed through the mercy of God rest in peace." Records are kept by the church, 601/631 N. Tejon St., Colorado Springs, CO 80903; telephone (719) 633-5529.